Locals holding signs reading “Bring the Troops Home” met U.S. Senator John Kerry at Worcester’s Broadway Diner this morning. Despite Kerry shaking several of their hands, many remained frustrated with his lackluster efforts to withdraw troops from Iraq. Paul Giorgio and John Kerry. Photo: Kevin Ksen. Many local bigwigs were there. The response from passers-by was very positive. This sign was too big to hold tight. Photo: Kevin Ksen. Worcester Indymedia has more coverage. 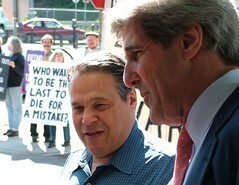 At a February 2005 visit to Worcester, Kerry called for military expansion.